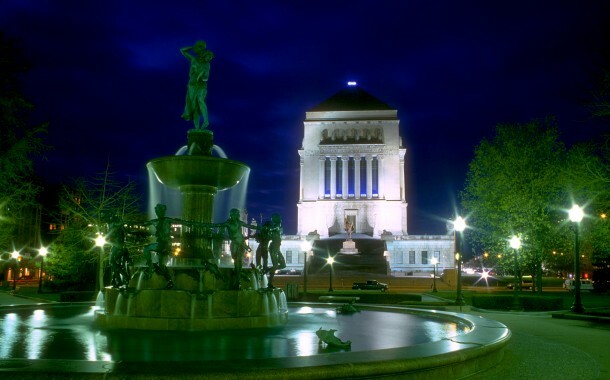 Indiana War Memorial DePew Fountain « Davis & Associates, Inc.
Davis & Associates completed the restoration of this historic landmark that included repair of all cracked curbs and sidewalks, refurbishing of the fountain, re-plumbing and re-wiring. Located between Vermont Street and New York Street, University Park was set aside in 1919 to be the site of the state university. There are five levels to the fountain, decorated with bronze fish, children playing, frogs and a woman draped in a toga. This centerpiece of the park is the DePew Fountain, designed by sculptor Karl Bitter and executed by Sterling Calder, and was dedicated to Indianapolis by physician Dr. Richard Johnson Depew in 1919.